The ‘Arab’ World vs. The West: Where Are the ‘Peaceful’? Following the wave of violent protests that swept through the Middle-East and much of the ‘Muslim’ world earlier this month, where many lives were lost and irreparable damage was done, Newsweek’s cover-story was about ‘Muslim Rage’, a term so broad, crude and rude that it caused even more rage. 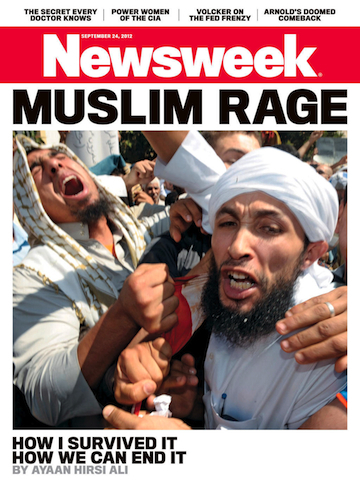 However, you can be sure that Newsweek Editorial, though guilty of blatant racial profiling, were not alone in wondering whether such a thing as Muslim rage did exist: was a pattern emerging that showed that Muslims around the world were inherently defensive, enraged and violent? Following the Newsweek debacle, this cleverly put-together piece showed that Muslims are just as capable of being happy, chilling out and having fun. As usual, the media was allowed to get away with presenting a clearly one-sided view of a very complex and many-webbed story. Even examining the term ‘Muslim rage’ begs a series of questions about the cause of that rage that Newsweek didn’t bother to explore. As we know, the Muslim-world has more than several reasons to be angry, particularly to be angry at the West and the US, not withstanding the years of war, death, military oppression, torture and arbitrary incarceration of the civilians of its many countries, for which the West and sometimes the US alone has directly been responsible. So, when a protest that allegedly began as a protest against a film in no time turned into protests against the US, which in no time turned into protests against ‘the West’, it was no surprise. Chillingly, reports now say that the film was online for months, without drawing any major international attention to itself. As September 11th neared, however, things took a drastic turn for the worse, as the film had by then seemingly reached viewers in Libya; on September 11th, attackers armed with rocket-propelled grenades, with furious anti-US slogans at hand, carried out the attack against the US embassy in Libya. Also chillingly, new reports now say that it seems as though this attack was planned in advance. Subsequently, other Muslims across the world then took it upon themselves to attack any ‘Western’ consulates and/or embassies; rioters in Sudan even attacked the German embassy. While the protests rages for days unabated, it resonated deeply with people everywhere: it became a cruel reminder of the events of September 11th 2001, and everything that has followed in its wake. It served to remind us that this violence still continues; that two extremely volatile and equally ruthless forces, call it what you will – the US vs. the ‘Arab’ world, Christian fundamentalism vs. Islamic fundamentalism – are still at war, and we are all caught in the crossfire. But very much more directly in the line of fire are the innocent civilians of both these places, of both these faiths, and particularly vulnerable are the civilians of the Middle-East. The film was clearly made by someone with irrational Christian-extremist, possibly white-supremacist views, and it reveals to us something we wish not to see: that people such as this still exist in the world, in the US, and they won’t sit idly by. They want to be heard. On the other hand, the reaction that followed the film – all the blood and carnage – was revealing of the fact that there exists an equally vindictive and bloodthirsty ‘other’ at the receiving end. This conflict, at a glance, has nothing, and yet everything, to do with religion. Frighteningly, both sides of this conflict feel morally justified in wreaking havoc and causing pain. Several things were clear: the governments of these countries whose consulates were attacked – even the government of the United States of America – had nothing whatsoever to do with the said film – in fact, the protests were not really about the film at all. It was equally clear that this kind of violence did not represent the views of the entire global Muslim community. Then where were, and where are, the voices of the peaceful, the non-violent, the moderate and why, in times of conflict, are they never heard as clearly, or as widely, as the extremists? Why is it that we are so often represented by those who have gone over the edge? So, where then are the voices of the peaceful? Where are all the non-raging Muslims and the non-war-mongering Americans? As we find too often in life, the Muslims like those in the 13 images presented to us the Gawker’s funny piece (link above) are not in the news. It is the angry mobs of men, such as those on the cover of Newsweek, that make the news. As this article quite rightly points out, the ‘peaceful’ do not have, and never have had, much advantage in a struggle against extremism and fundamentalism, because the fundamentalists are willing to kill and be killed, and the ‘peaceful’ simply are not. Then are we, as ‘the peaceful’, simply sentenced to a life of being associated with those who are extreme, because they are the ones the world hears? A life of being mistaken for being the same as the extremists, even? Am I, as a Sinhalese, content with the fact that much of the world believes that all Sinhalese are Tamil-butchering racists? No – but I have to admit that perhaps I have not done enough to prove otherwise. The odds are stacked against us – we have to not just be loud, but as loud, or even louder, than the deafening din of the cries of extremists. We have to be as passionate, if not more passionate, to match the all-consuming, blinding passion of the extremists. Perhaps you think it unfair that we, who are peaceful, have to prove to the world that peacefulness exists. But we do. And it’s time to stop being defensive and arrogant and get out there. We need to show that we are here, there are just as many, if not more, of us, we reject all forms of violence; that this violence cannot continue to be carried out in our name.